The Pit is home to dozens of people who are homeless, most of whom struggle with addiction, mental illness or both. The grounds are littered with tents, garbage, stolen property, used hypodermic needles, and makeshift shelters. Every community has at least one place like The Pit. Snohomish County has dozens. After years of data and seeing the same faces over and over again, Snohomish County Sheriff Ty Trenary (along with dozens of other chiefs and sheriffs across the country) could see that the approach was not working. The county still had homeless people and mental illness in this population continued to go untreated. Problems related to drug or alcohol addiction not only continued, but were rising. The people sent to jail for trespass would come back out in two to three days and go right back to living on the street. 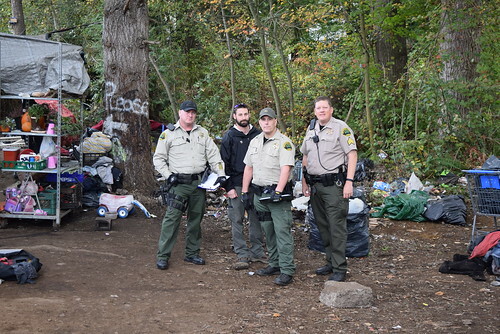 As a result, Office of Neighborhoods deputies are charged with reaching out and trying to connect each person with service they need. Within the first month of the unit being fully staffed, they made over 200 individual contacts in the field. The hope in Snohomish County is that the new approach by Office of Neighborhoods stops funneling vulnerable populations into jail and instead into the services they need.